"I didn't even consider not doing it," said one microchipped employee. Sensors and microchips may signal a new era of a connected workforce, but some experts say these technologies also put employees' privacy at risk. For example, a recent patent submitted by tech giant Amazon describes an electronic wristband that could monitor employees' tasks. Three Square Market, a tech company based in Wisconsin, started an optional microchipping program for its employees in July 2017. UPS has sensors on its delivery trucks to track the opening and closing of doors, the engine of the vehicle, and whether a seat belt is buckled. Sam Bengston, a software engineer at Three Square Market, said he readily agreed to be embedded with a microchip. "I didn't even consider not doing it," he said, adding that he uses the chip to swipe into secure rooms and log into his computer. "It has been really convenient and a really positive experience." These innovations can blur the line between security risks and better productivity. "Across companies, across the world, employers are looking to have a more interconnected workforce," said Daniel Ives, a tech industry analyst from GBH Insights. "Big tech companies are looking for ways to give employers a leg up and data insight into their operations and employees." 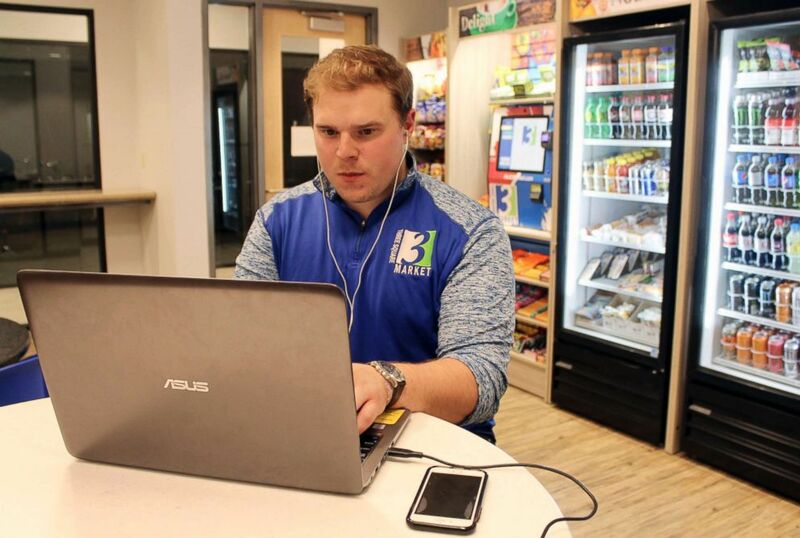 (Jeff Baenen/AP) Tony Danna, vice president of international development at Three Square Market, works on his laptop in a company break room at its headquarters, Tuesday, July 25, 2017 in River Falls, Wis. But those insights may come at a cost to employees' personal privacy. "From an employee and a personal data perspective, that information is sensitive," Ives said. "If that information gets into the wrong hands, it's no different than a major security breach." Added Paula Brantner, a senior adviser at Workplace Fairness, a nonprofit public education and advocacy organization that works to promote and protect employee rights: "People don’t realize that there aren’t a lot of laws protecting privacy in the workplace. Part of the issue is that employees may not even be aware of how all the data is being tracked and how it's being used." A patent for smart wristbands that would be worn by Amazon fulfillment center employees was approved at the end of January. The wristbands would use ultrasonic tracking of a worker's hands to "monitor performance of assigned tasks," according to the patent application. The device is designed to emit ultrasonic pulses to alert the wearer to inventory locations, Amazon said, adding that the wristband would reduce the need for regular scanners. 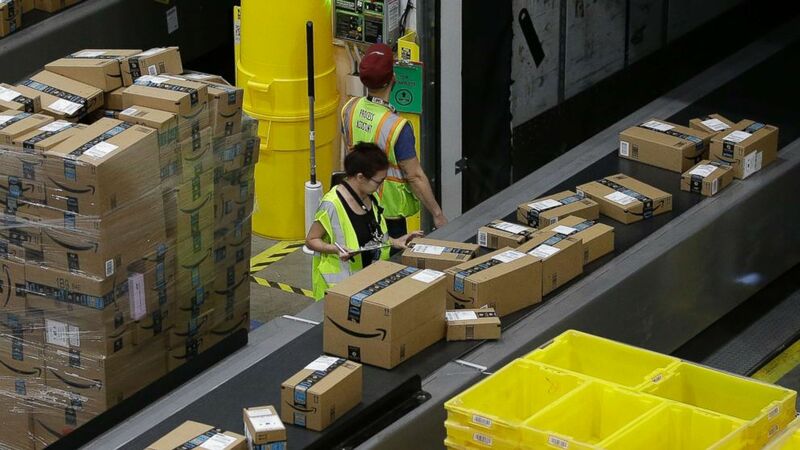 (Rich Pedroncelli/AP) Packages move down a conveyor system to the proper shipping area at the new Amazon Fulfillment Center in Sacramento, Calif. on Feb. 9, 2018. "Every day at companies around the world, employees use handheld scanners to check inventory and fulfill orders," Amazon said in a statement to ABC News. "This idea, if implemented in the future, would improve this process for our fulfillment associates. By moving equipment to associates’ wrists, we could free up their hands from scanners and their eyes from computer screens." The statement added, "The speculation in the press about these patents continues to be misguided. We do not track nor do we have the intention to track the location of our associates. We develop and implement innovative technologies in our operations to enable an incredible customer experience and to enhance the safety and ergonomics of our processes." Brantner said she was skeptical of Amazon's intentions. "The proof will be when and if they implement it, and how it will be used," she said. Employers can install video cameras, read postal mail and email, monitor phone and computer usage and use GPS tracking, according to Workplace Fairness. "The workplace is full of examples that in some way determine whether your work performance adds up," Branter said. "Like production line workers that are forced to work at a certain pace and call centers that track length of time on the phone." Employers also have access to company emails and computers, she added. Major tech companies often apply for experimental patents, Ives said, and it's inevitable that tracking will take on new forms. Accepting a certain amount of privacy invasion has increasingly become part of the job, Branter said. "People are just going to accept this as something they have to do to keep their job," she said. "In some ways, we've already lost the battle." She noted that data is already being collected about people's movements and stored under unknown conditions. In some cases, employees opt in to be monitored. More than 50 of Three Square Market's 80 employees agreed to have microchips inserted into their hands. 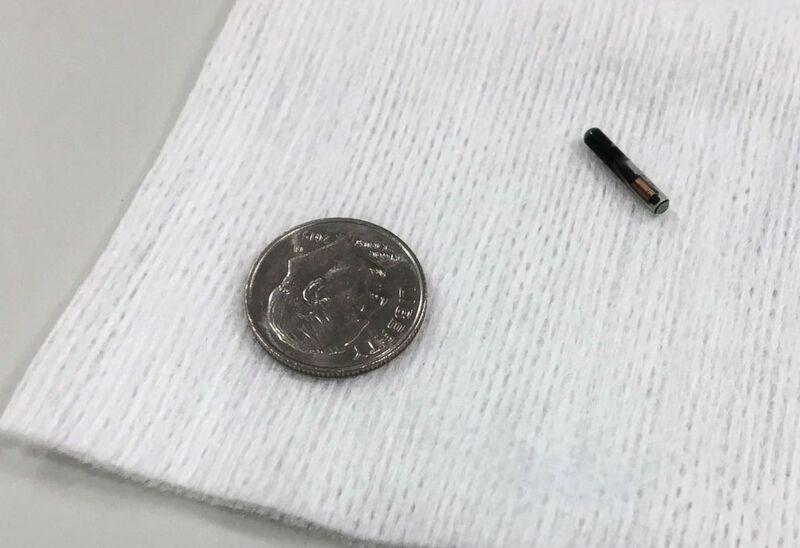 The chip, which was implanted in the skin between an employee's thumb and pointer finger, allows employees to swipe into the building and use the vending machine. The CEO of the company, Todd Westby, said he has one, and his wife and young adult children will soon get their own microchips. (Jeff Baenen/AP) A microchip is shown compared with a dime, Aug. 1, 2017, at Three Square Market in River Falls, Wis. for employees who volunteer to have the microchip embedded in their hand. "That particular microchip is not used for tracking, but instead to replace passcodes and badges, used with vending machines to get something, or for getting into a secure areas," explained Daniel Burrus, a tech industry expert and futurist with his own research firm, Burrus Research Associates, Inc. "That's kind of a fringe technology." Bengston said his Three Square Market microchip saves him at least 20 minutes a day. "You can basically put any scanable documents or personal data you have on [the chip]," Bengston said. "I have my driver's license on it, so if I get pulled over, I can simply scan [the microchip] and have it right there." (Jeff Baenen/AP) Tony Danna, left, vice president of international development at Three Square Market in River Falls, Wis., reacts while getting a microchip implanted in his left hand at company headquarters, Aug. 1, 2017. When it comes to privacy or security concerns, Bengston said he isn't worried. "I know that everything on there is encrypted to the highest level it can be," he said. "As for Big Brother, we carry our phones around in our pockets everyday, which always knows where we are." The Three Square Market chip uses radio-frequency identification (RFID) technology and was approved by the Food and Drug Administration in 2004. The company foots the bill of the microchips, which are $300 each, and if a worker decides they no longer want to participate, they can get it removed. UPS said it utilizes sensors to ensure the safety of its drivers. "The sensors are not designed to track our drivers, but rather to monitor vehicle performance and ensure safe vehicle operation," UPS said in a statement. 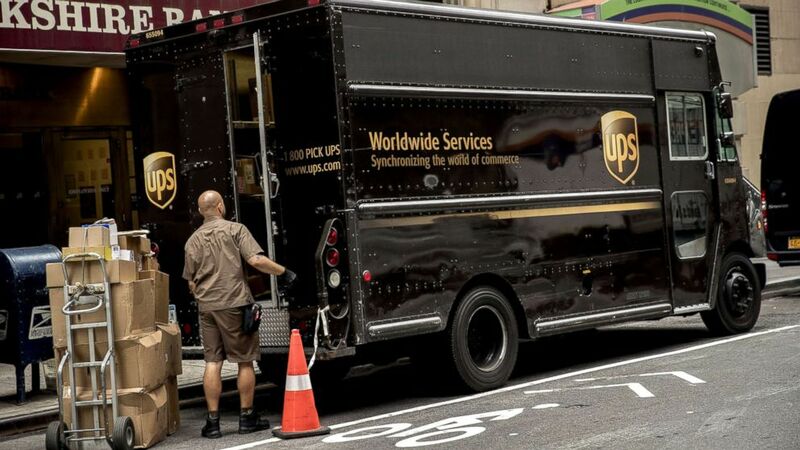 "UPS employees are aware of the sensors on the company’s vehicles and the intent of the technology, which is to monitor vehicle performance and safety. We are and will continue to be transparent with our employees about the use of technology." The sensors collect data that can be analyzed to improve delivery methods and optimize the vehicles, UPS said. "We do not discipline our personnel based on the sensor information we collect," UPS said. "If the vehicle is being used in an unsafe manner, we use this information to engage the service provider in further training." (Victor J. Blue/Bloomberg via Getty Images) A driver for an independent contractor to United Parcel Service Inc. (UPS) prepares to load packages onto a delivery truck on a street in New York, July 24, 2017. The decision to use tracking technologies should be a conversation between the employer and employee, Burrus said. "You want to have a good, positive relationship, and high trust [between employer and employee]," he explained. "They have to be open about how they're using the technology. Doing it by permission is better than having [employees] find out later." Ives agreed that employees and companies should agree on the terms. "You don’t want to feel like you're being watched," he said. "This is going to be a big topic for years to come."